This lesson will show how quickly and easily you can set up and start using an SQLite database using LiveCode. This example will work equally well on the desktop and mobile with no changes required. Our example database will contain one table holding contact details. In this example we wil be building our stack into an app so open a new Mainstack from the File menu and set its width to 768 and its height to 1024. To do this we need 4 buttons to perform these actions and a field to display the information we retrieve from the database. Drag the buttons and field onto the stack from the tools palette and name them appropriately. LiveCode provides a full range of commands and functions allowing communication with external SQL databases. You use SQL queries to specify the parts of the data you want to work with, to get data and to make changes to the database. LiveCode provides built in drivers for accessing SQLite databases, no additional installation is required. For more details on LiveCode database functionality see the Dictionary and the User Guide. The first thing we need to do is establish a connection with the database. To do this we use the revOpenDatabase command. This command establishes a connection with the database and returns the connection id. We store the connection id as we will need it when we want to communicate with the database. The command will create an SQLite database if it does not already exist. Add the databaseConnect handler to the card script. We also need the commnd setDatabaseID, which stores the database connection id in a script local variable, and the function getDatabaseID, which returns the database connection id so we can use it. Script local variables are defined outside of any handler, they are then accessible to the scripts of all handlers that appear after the variable definition. In this case we will define sDatabaseID in the card script, above the handlers that use it. We could put all the code in the button script but I prefer to keep all the database handlers together on the card script. Next we want to add a table to the database. To do this we construct the SQL statement that will create the table and use the revExecuteSQL command to execute the query in the database. 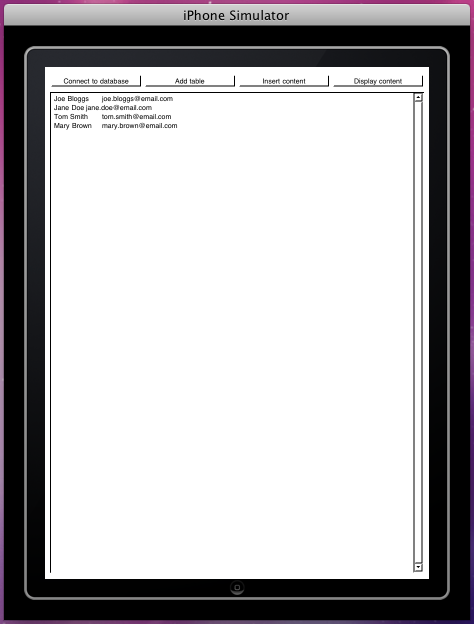 The next step is to insert some records into the contact_details table we have just created. Just as in the previous step this is done by constructing SQL Insert statements and using the LiveCode database commands to execute them in the database. Now we have a database with records in it, we need to retrieve that data and display it. Just a before we use and SQL query to retrieve the data from the database but in this case we use the revDataFromQuery function as we want it to return data from the database so we can display it in the field. put databaseGetContactDetails() into field "contact details"
To create and populate the database and display the content we just need to press each button in turn. For this example we are building an iOS app so open up the Standalone Application Settings and select the iOS panel. Set the Internal App ID (1) and choose your profile (2). Select the SQLite External from the Inclusions pane (3) and Portrait Orientation (4) and choose the rest of your settings (5). Now deploy your app to your chosen device. As we stated at the start this stack will work just as well as a Desktop application with no changes required. 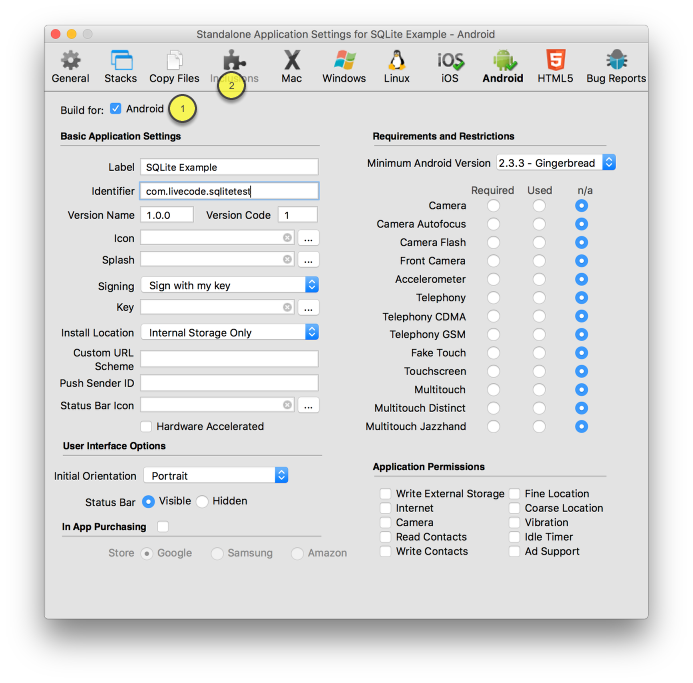 To deploy to Android you need to open the Standalone Application Settings. Check Android in the Android pane (1) and check the SQLite External in the Inclusions pane (2). Then select the device or simulator in the Test Target in the Development Menu, click Test in the menubar and your application will be deployed to the device. It seems like we haven't defined setDatabaseID... or is that built-in and should be working? Thanks for pointing out that omission. The lesson has now been updated with the setDatabaseID command and getDatabaseID function. This example actually does create an SQLite database from scratch. The first step is to create the empty SQLite database file, we then use SQL statements to create a table and its fields and insert data into the table. In LiveCode that is how you would create a new SQLite database. You do need to use SQL for this, there are not any LiveCode specific functions and commands for creating tables, adding fields etc. This all has to be done using SQL and the revExecuteSQL command. I didn't try this tutorial until after you fixed the bug David found, but I found another one. It is fixed in your example file, but it is NOT mentioned in your directions. What is left out of the instructions is definition of the local variable sDatabaseID in the card script outside (i.e., before) all the handlers. If I understand correctly, because the variable is not defined as local to the script initially, it is being defined implicitly within the setDatabaseID command. And that implicit definition makes the variable local to the command, so its value can't be referenced in the getDatabaseID function later in the code. The requisite script-local variable definition is present in the example code you posted. I managed to figure this out on my own before I downloaded your example, but it took awhile. I post this comment in hopes of helping anyone else attempting this tutorial avoid this particular headache. This may have been obvious to more experienced users, but I wouldn't count a novice like me being able to see it immediately. Anyway, thanks for so much that is right and does work. -- An old Hypercard/Supercard user who is happy to find LiveCode. Thanks for your comment Mike. Not explaining script local variables and including the variable definition when giving the handlers was an oversight and I have updated the lesson to include that explanation. I'm glad you have found LiveCode and I hope you enjoy working with it. the field_phone will contain "SW", that is the second word inside the string. So, how data retrieved from a db is handled in LiveCode? LiveCode allows you to specify a delimiting character and then select items that are separated by that character. Have a look at "itemDelimiter" in the dictionary. You would then use the "item" to select values from the string. Yes, it worked fine. Thanks. answer error "Could not connect to the database"
This tutorial works in LiveCode i.e. this if statement doesn't thrown an error. However when I send the app to the android emulator, this if statement is true and says that it cannot connect to the database. Maybe the database file "sqlite" isn't sent to the emulator. How to ensure that the enumator receives the file and where does it receive it? I tested your code in the context of this lesson and was not able to reproduce the problem you are describing. The emulator does support SQLite, so the code there should behave in the way you would expect it to work on a device. Try taking a new copy of the lesson and run it again. I've resolved the issue of grayed-out Test/Test Target. But now, when I click of Test, I receive a message "Unknown deployment platform." I never got that error the first time I followed this tutorial, yet I followed the same steps. you would get the message "Unknown deployment platform" when LiveCode cannot find the emulator after you select the "Test" button. You would normally only be able to select the "Test" button when the emulator was detected. However, if you closed the emulator after LiveCode had detected it, then the "Test" button would still be active and you would get the message you describe. Try closing down LiveCode and the the Android emulator. Then start the emulator and LiveCode again. from the Android SDK platform-tools directory. This restarts the Android Debug Bridge and can help reconnect the emulator again. You may get this message when LiveCode was started with the Android Simulator running. thankyou so much for the above lesson. I have managed to use it to complete a database based app that also runs on the simulator. I need the simulator to either delete its own database, or to realise it has already made one. At the moment, if it is reopened, it makes another database and adds it to the previous one. This causes problems in the program. I wonder if you could tell me how to delete - I have tried from the database information in the dictionary, but it didn't work. answer "A database already exists" with "Okay"
If you want to delete the database, then have a look at the delete file command in the dictionary. I found a way to find the database - if it is already there - which works on both Mac and the iPhone simulator and the device. It turned out to be very simple. It depends what you want to achieve, you may get the result you want using the revQueryDatabase function, this returns a set of records which you can then set through using commands such as revMoveToNextRecord. Alternatively you could format the results of the query into an array and access the information in that way e.g. How can I change the example codes to access on my iPad a SQLite table already populated with data and saved on my C:\drive? 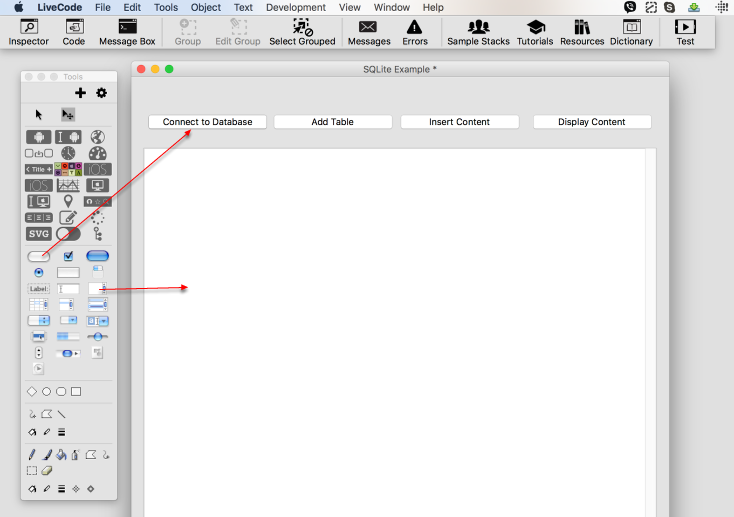 How can I import the SQLite table on to the iPad and access the records from there? You won't be able to access a database on your computer as the iPad, whether its a device or the simulator will not have access to your machine. You can include a pre-populated SQLite database in your app when you build it by including it in the Copy Files pane of the Standalone Application Settings. Your app can access any files included here using specialFolderPath("engine"). However these files are read only, if you want to be able to update the database you will need to copy it to the writeable specialFolderPath("documents") folder. 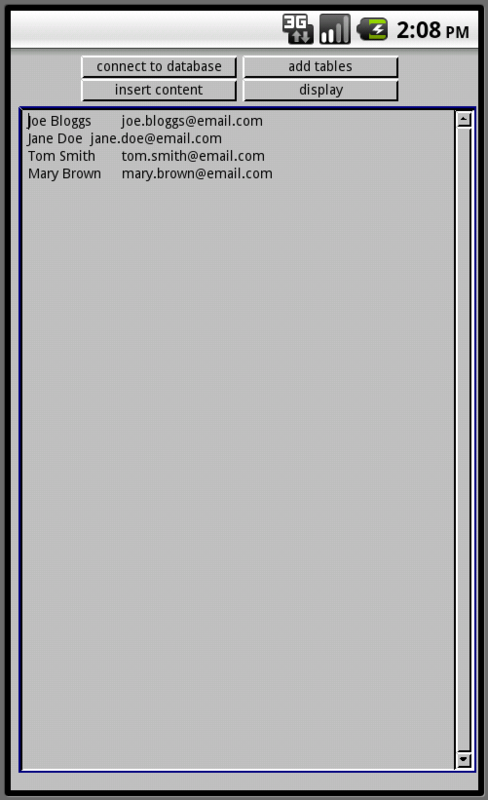 See the following lesson for more on accessing files on mobile. Honestly, I think this way to create DBs is not very intuitive. What if I wan to create an app that has pre-establish tables, and the end user will interact with the tables adding, editing, and deleting records. Or browsing only specific records. How do I do that? I have created databases before and I cannot wrap my mind around the use LC. What I don't see is how to use variables in the Insert statement. For example, suppose I wish to use the contents of some fields on a card, using the field names, such as fld "Name", fld "Comment", etc. You can also see and example of using placeholders in the SQL statement in the Dictionary entry for revExecuteSQL. 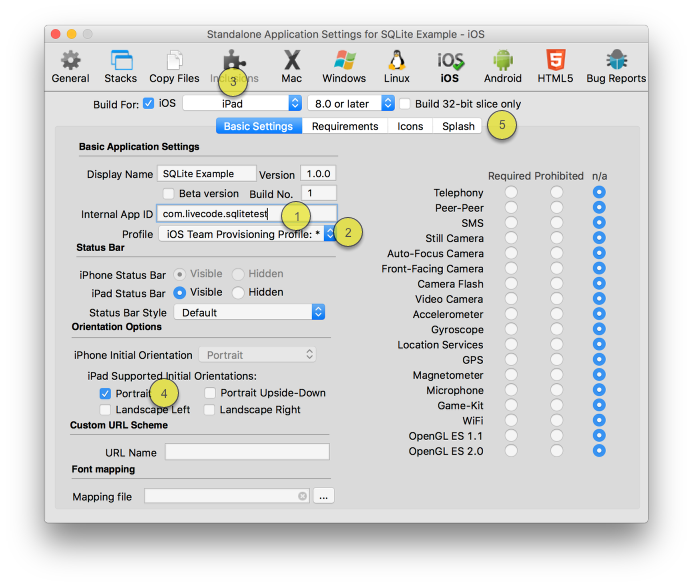 LC9.0 Indy > Standalone App Settings > Inclusions Panel > SQLite - IOS is not listed among the operating systems for which the SQLite External will work. Is this just a mistake with the graphic in the Stand Alone App Settings, or will SQLite really not work on IOS? Since I discovered this (https://community.filemaker.com/docs/DOC-7041 ), it sounds like a possibility to interact with the OSX Calendar App using SQL Lite. Could you elaborate some example? It has been a long time since it was suggested an interaction between LC and the default desktop calendar. While waiting for an answer, I made some experiments using your excellent lessons. I uploaded on LC Sample Stack a "lib_OSXCal" stack that does this: read calendar events from the Calendar Cache file, using SQLite. I don't even know if this is correct or it messes up the calendar file (I guess reading is ok, while writing could be a problem). I would appreciate some comments or SQL improvement (I am a NOB on this).